However you look at it, the only conclusion one can draw is that Hawkers is making good beer. The Reservoir brewery's growth since launching in February last year has been phenomenal, every beer they've entered into competition has medaled and there's buzz aplenty around the beer world. So, when one of the founders gets in touch to say he's really excited about a new beer, it's probably worth keeping an eye out. 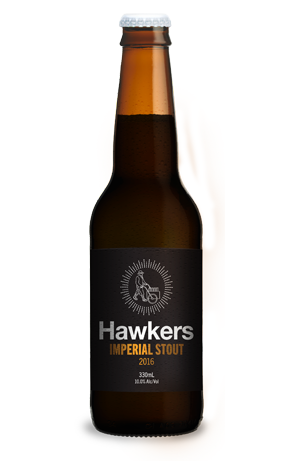 The beer is the first of Hawkers' imperial range, an imperial stout with its roots and aspirations very much in the style's traditional English heritage. We first sampled it pretty much straight off the bottling line and it was a beautifully balanced, smooth and subtle beer; all the elements of a traditional imperial stout were there, presented in a tightly wound package – nothing leaping boldly from the glass, just well crafted, stouty goodness. In the weeks since then, the beer has developed in bottle like a caterpillar waiting to emerge fully formed (hence, presumably, why there was a barrage of mock outrage from Hawkers' owner at our description of the beer as "smooth and subtle" in the event preview...). A little older, it has spread its wings and revealed something even better: rich, dark chocolate dominates, with coffee, dark treacle and Scottish tablet in supporting roles. It's got great texture, lingers long and is rather delicious. Look out for a Bourbon barrel-aged version to follow too.